"If you haven't already noticed, I shall now reveal to you that poets and musicians are joined in a very dangerous pact against the public. They intend nothing less than to drive spectators out of the real world, where they feel really comfortable, and...to torment them with all possible emotions and passions highly dangerous to their health.... But who shall prevent this nonsense?.... None other than yourselves, gentlemen. You have the delightful duty to unite against all the poets and musicians for the good of educated mankind." Don't your fingers get tired? 1) There is no such thing as a dumb question. 2) Most of the "dumb questions" have already been posted--by me! 3) I would consider it a favor if you ask me any of the "dumb questions" I left out because I'm sure lots of folks would like to know also. What is perfectly obvious to a concert pianist is not necessarily obvious to someone who is not. Hey, Michael! Don't your fingers get really tired after a concert? Not really. I generally practice for at least four hours a day (used to be six but I started getting lazy) so a 90 minute recital program, while it can be exhausting, usually wears out my brain a lot faster than my fingers. Of course, the fingers can get pretty worn out after a long day of practicing, but it also has a lot to do with what I'm playing. If it's something with about eight billion notes in it, they'll get tired a lot faster than if it's, say, Mozart. How do you memorize all that music? Like everything else, it takes practice. I memorized everything I learned when I was young, and the more one memorizes, the more one learns to memorize. I had a good memory as a child, but I didn't start out being able to play six hours of piano music from memory. (That, incidentally, is something I specifically set out to do on more than one occasion.) It helps tremendously if you understand thoroughly what you are memorizing, in terms of musical form, harmonic progressions, and so on; sort of like having a zip drive, for you tech people, or being able to summarize what you've read, and fake parts if you have to to keep going. There is a University in the Middle East that requires its entrants to be able to recite the entire Koran from memory, which I've heard takes about three days. They have to start learning it very young and keep at it for many years. It may sound like a feat of genius, but I think it's mainly about discipline and perseverance. With regard to the astonished people after a concert who ask me this question, the answer is a lot like my answer to the previous question. If you've learned to memorize that much material, a 90-minute program doesn't seem like that big a deal, though it still depends largely on the types of pieces you are playing. Some of my colleagues at school panic when they get close to recital time because they haven't tried to memorize their pieces yet. Learning it without memorizing it and then trying to tack that on at the last minute is a great way to cause panic. But then, I was a lousy sight-reader in my youth, so I tended to memorize things quickly so I wouldn't have to look at the notes! Apparently I also had terrible vision, but that's another story. How come all the great composers are dead? They aren't! A slightly more accurate assessment of the situation might be to ask why all the famous composers are dead, which isn't true either, but it comes closer to the truth, and there is a good reason people have that perception. It usually takes a while to gain fame, particularly the kind of fame where virtually everybody has heard your name whether they are the least bit interested in what you actually do. Everybody has heard the name Beethoven, though few people could whistle more than the first eight notes of his fifth symphony or get caught dead at a symphony concert. Beethoven has become an image, an idea, more than simply a composer. This usually doesn't happen until a person has been dead long enough for the mythmaking process to take hold. Usually in one's lifetime it is enough to be controversial--loved by some, hated by others. Our most famous presidents, Washington and Lincoln, where hardly loved by all their countrymen, as you might think watching them sell cars every February. No rabid Republican's criticism of Clinton or any unmovable Democrat's hatred of Bush comes close to what some of their contemporaries were saying about them. And fame has its own timetable. Beethoven was well known throughout Europe well before he died. Brahms lived long enough to be generally thought of as the leading composer of his time, as did Haydn. But Schubert was only known in his native Vienna when he died at the ripe old age of 31. Mozart was respected, but not as highly as some of his contemporaries, and Bach was dead for a hundred years before he became an institution. One of America's most innovative composers, Charles Ives, dead since 1954, is still largely ignored by his countrymen. On the other hand, Scott Joplin had the luck to have a popular movie set two decades after his death to ignorantly use his music as a "period" soundtrack and became a sensation once again, fifty years after his death. As in most fields of endeavor, a musician can name and greatly esteem the important contributions of many composers the rest of us have never heard of. Once we divorce fame from the strength of one's contribution to humanity (I'll bet many of you don't know the name of the guy who discovered a vaccine for smallpox, thereby saving millions of lives but can name the last celebrity accused of murder in an instant) we are back to the question of who is actually composing good music today (and might be famous for it tomorrow). Those interested in finding an answer to this question can check out a variety of online sources, including The Living Composers Project, The League of Composers, The American Composer's Alliance, and The Composer's Forum. The catch is that while the composers are there (many with their own sites and a variety of ways to hear their music) you will have to decide for yourself who among them is great, although some of them have already achieved major reputations in the music world. Some of these contemporary "giants" will appear on this site eventually, and while I won't guarantee everything you hear here will be great, it is certainly worth listening to, which makes it pretty darn good. Was Liberace a Great Pianist? When I was in elementary school, I would sometimes perform in school assemblies. My fellow students, impressed, would refer to me as the next "Liberace," who everybody knew was "the greatest pianist in the world." That should tell us something about our society--that we have to have a champion of everything, even in an area where such rankings are miles away from the real issue! Since I had heard that Liberace was so great, I asked my parents to take me to see him. After the concert, most of which Liberace spent in talking about how fabulously wealthy he was, I decided I didn't care much for him. He may have been an impressive technician, but was he a great pianist? The word great, if it really means anything at all, implies to me that he would have to be not only capable of the technical feats of pianism, but also able to interpret great music with the passion and understanding needed to make it move our souls--that he would possess the insight required to reveal it to us whole, and not be a mere machine. Liberace was not a poet, nor did he try to be one. He enjoyed being a showman, and answered his critics by saying that their criticisms wounded him so much that he "cried all the way to the bank." Many classical artists would call this "selling out"--playing stuff that didn't demand much of the inner person, or the real difficulty of pianist technique in order to make money enchanting people who didn't know better. I would like to have heard him try to play something of substance before I judged whether he had this poetic ability or not, but perhaps the answer lies in the fact that he didn't take that road. What he did, he obviously did well enough to make millions of people interested in him, and this seems to have been his primary goal. He was under no illusions about what he was doing. A quote of his that I included a few months back on the Pianonoise banner reads "My whole trick is to keep the tune well out in front. If I play Tchaikovsky I play his melodies and skip his spiritual struggles. Naturally I condense. I have to know just how many notes my audiences will stand for. If there's time left over I fill in with a lot of runs up and down the keyboard." There have been pianists doing this for as long as there have been pianists. Liszt, possibly the father of the piano recital, was largely a showman, though he also wrote some works of substance and perhaps genius (and real technical difficulty, by the way), and Gottschalk, who you can read about on this website also falls largely into this category, though his compositions are sometimes sufficiently intriguing (his life story certainly is) that I occasionally play them. I don't have any venom against showmen, I just wish they would ask a little bit more of their audience--and worry a little bit more about giving something to that audience besides the thrill that goes with imagining that their hero did something really death-defying, particularly when they didn't! But the real difference is in the attitude. Rachmaninoff (who could really play) said once that "music is enough for a lifetime, but a lifetime is not enough for music" whereas, Liszt said magnificently "I am the concert!" There is always something greater than the performer. Let us not forget it. What is that blinking light on the piano for? That is so airplanes won't crash into it. Well, that, and the fact that it is attached to a humidifier (aka, damp chaser) whose function is to keep the large wooden soundboard which forms the "bed" of the piano (if it is a grand; in an upright model the sound board is in the back, vertical) from drying out. If you look under the piano, you'll find a pan of water there. This helps to keep the piano in tune. Temperature changes, but more particularly changes in humidity, can be murder on a piano's ability to stay in tune, or even remain playable after a while, and a piano in a large space may suffer enormously from rapid changes in humidity. At my church we have such a device, which I maintain each week by watering our 6 1/2 foot Yamaha. I tell people that it is so the piano will grow into a 9 foot Steinway. If the light is blinking, it means the pan beneath is out of water. That, I am proud to say, has not happened to our piano in months, despite the fact that people keep unplugging the humidifier. If you see a piano with a blinking light, remind people to water their piano. I get asked this a lot. I haven't got a good answer for it, because I don't think I currently have a favorite composer. On the other hand, there was a time when I ate, slept, and breathed Mozart, and a time a few years later when I ate, slept, and breathed Brahms, but as I've aged and begun to compose myself, I find that the music of the past is often wonderful, but does not have the last word on everything the way we all seemed to think it did at the music conservatory. That and the fact that I've become so familiar with the "standard repertoire" that I have it memorized (including the complete piano sonatas of Mozart and all the piano works of Brahms--or at least I did once) that it does not enchant me as it once did--at least, not so often. I frequently cannot listen to classical radio because I've heard those pieces so many times (like yesterday, when they played it the last time!). These days I tend to explore more and to try pieces which are more obscure or more modern. And to play my own stuff. But I always play some Bach, and Brahms, etc.--or at least I return to them periodically, and am glad I did. In one sense, I wonder if it really matters that much since there are hundreds of gifted pianists playing this repertoire, and still not many who want to listen to it, and besides, if I have a unique creative voice I should use it and leave the Beethoven interpretation to hundreds of others. But I am still drawn to this music much of the time--I just don't worship it the way some do. There is a reason that it is considered great, and I'd like to think I know why. One's tastes and obsessions change over time. I've only had the confluence of circumstances that enable me to do a lot of recordings for this website over the last couple of years (since about 2004) so the recordings index represents only a snapshot of my recent situation (and then only when I was finishing my degree and out of practice)--all of that wonderful Mozart and Brahms is lost--perhaps I will return to it and post my renditions. At the moment I am finishing a project to learn (and record) the complete works of Michael Praetorius. I have spent the last couple of years fascinated by Renaissance organ music, and, as a result, the index is skewed toward that style of music. I've also had some difficulty making decent recordings of piano music, so there is more organ music on the site. As a church organist with more time on his hands than when he was finishing a Doctorate in piano, I'm getting to know that massive repertoire more and more also. A question I got asked a lot growing up: Do you want to play in an orchestra? I've included this question mostly because it gives me a chance to differentiate between two things. One is playing with an orchestra as the soloist, and the other is playing in an orchestra. Usually in a classical orchestra a soloist is brought in from out of town to play the pieces for piano and orchestra (usually called Concertos) in which the pianist has a big solo part, and he/she plays that one piece for that one concert. Basically life consists a lot of one-night stands if you are a solo pianist, and a lot of travelling. On the other hand, most orchestras have resident pianists as part of their group, but the pianist may not get to participate that often. Most music written before the 20th century doesn't include a piano part with the orchestra, so the staff pianist will have several nights off, or only play one piece on the program. They will also be found in the back of the orchestra with the percussion, not up front in the 'glamour' position. Anyhow, I have played with orchestras, as a soloist, and in them. Both are interesting experiences. Once I played in a concert with a wind ensemble (like an orchestra but with no stringed instruments) in which the piano part was pretty extensive but not technically the solo part. It was supposed to be in back of the group, and electronically amplified, but the conductor moved it out front into 'solo' position. There was also a part for several wineglasses on the table behind me. I thought it felt like a strange combination of playing a concerto and playing in a restaurant. Last night at the Lawrence University Conservatory of Music, my nephew turned the pages for the pianist playing in a Brahms trio for clarinet, cello and piano. Could you tell me why the pianist was the only one whose pages are turned? When and who composed the first music requiring page turning? Is music written in such a way that only the piano parts primarily need a page turner? And why are piano parts written that way? Hi, Bruce. Good questions! I don't have what we'll call 'definitive' answers, but as a pianist I can give you my thoughts. When I am playing a solo recital, I do it from memory. That is a custom that probably dates to Clara Schumann in the mid-19th century. Obviously, you don't need a page turner for that. The idea of the pianist playing without music wasn't always the norm (did they have page turners before that? I recall an incident involving Beethoven playing his Third Piano Concerto on a concert and a student turning pages for him, so apparently they did...) I don't think we know when the practice began, though. Probably about the time that concerts themselves began (which was probably in England in the late 1700s). Page turners have a long history of remaining completely anonymous, which is why there is little information about them (save a few humorous anecdotes). However customary it has become to play without music in a solo recital, it is also customary to have music when you are playing 'chamber music' (music for a small group of players) such as the trio you heard. Since the pianist usually has both hands occupied, it makes sense to have help (believe me, I know!). But, you ask, don't the other players need both hands free to play their instrument, too? That's where my theory breaks down. But... Violin parts only require one staff of music, which means they can fit a whole lot more music on one page. Sometimes the entire movement. The pianist, on the other hand, not only has music that takes twice as much room, his copy of the music has the other parts printed above (a 'full score') so he can see what the other players are playing, which takes up a lot more room on the page, and means about 5 times as many page turns. Also, I think the stage would get pretty crowded if everybody had their own page turner! So between this idea, and the fact that the string players have a lot fewer page turns (and maybe none very difficult if the publisher has bothered to arrange the music so that there aren't any 'tricky' page turns--ie, plan the music so that the turn is during a 6 bar rest or something) it doesn't seem nearly so important to have page turners for the other players, and it keeps page turners from getting bored in the five minute spaces between page turns for the violinist, and envious of the guy turning for the pianist, for whom life must be so much more interesting! I have a question about a certain phrasing or type of playing I heard today. I have heard this many times in many different forms is that what is called honky tonk and if so, is this just a scale manipulation for that circular sound? Any thoughts and/or light you could shed on this would be very helpful. PS I own the cd and only used the youtube reference for... well reference to this question. They weren't a whole lot of help. I told Steven I hoped we'd both learn something. Then, when I finally got around to answering his email, I discovered I had lost it. Probably deleted it by accident when clearing out all the spam my filter isn't getting rid of for me. So, Steven, the best I can do now is to answer the question in this forum and hope you are reading it! I feel rather ignorant when it comes to identifying styles of popular music. Part of that may be an instinctive avoidance of labeling which creative people of all types tend to have anyway. One thing that amused me is that, in doing some internet research, several sites referred to a "Three Dog Night style"--which I suppose was helpful in putting them on the map in the first place. If you have a distinctive style of your own, and people like it (and they name it after you), you have a pretty good basis for a career. The terms Steven used show us why it is so hard to write about music. What exactly does he mean by a 'circular sound?' As for the 'scale manipulation, I think this last bit will be more useful to pianists, but what I'm hearing is a blues scale, which includes a couple of notes that aren't in the major scale, and therefore give blues-based music a different sound. In a c major scale, for instance, you have c-d-e-f-g-a-b-c. But a blues scale does two things differently. It adds an Eb in front of the E. In a European scale system, Eb would be an important part of a minor scale, but not major. Having them both (the Eb is often referred to as a 'blue note') means that the listener often experiences a kind of tension between major and minor, or--to express this in emotions--between joy and sorrow. This effect is heightened when singing, because a singer often slides between the Eb and the E, using pitches that aren't all one or the other. The other notational change is to replace the B natural (which is the all-important 'leading tone' in most western music between 1700-1900, and is often, but not always, used today in the same role) with a Bb, which might be experienced as leading us toward another harmony (the fourth chord of the scale), or as having a looser relationship with the home pitch of the scale (the C in this case), which might make the system less formal, less tight, or less goal-directed (all speculations involving various musical-psychological assumptions, however). I've been doing a lot of improvising of this sort lately without really knowing where it all comes from, which might be like not knowing your musical family tree. Musical styles are bidirectional, however. People need labels to define various kinds of music and to distinguish them from one another. But as soon as they do, artists come along who blend them together, making the boundaries between them quite porous. You don't have to practice anymore, right? Heck yes I still have to practice! Every day, if possible. For several hours, if I can. Many (if not most) people have this idea exactly backwards. It is assumed that if someone seems to be able to do something really well, and apparently effortlessly, then it is just something they can do without really trying that hard, and for the rest of us, too bad. You either have it or you don't. If that is your belief, then you don't have it. And you won't get it. But not for the reason you think. Bach said something interesting, which was that anybody who worked as hard as he did would get the same results. I imagine most people hearing that would say something along the lines of "Yeah, right!" and shake their heads. But do any of those folks have any idea just how hard Bach worked? Musicians who are accomplished tend to stress work (because of the thousand of hours they've spent practicing), and people who have little musical accomplishment tend to stress natural talent without work. I've noticed this over and over. Also, musicians who want to be showmen and popular with the public go along with the "it's all mysterious natural talent--I don't know where it comes from" idea. Where it comes from might be a mystery, but a seed will never grow into anything if you don't water it. I'm glad I overcame the idea that a talented person shouldn't have to practice: I think it was in the air when I was growing up, and eventually, it got practiced out of me or I never would have gotten where I am. One of the chief differences between amateurs and professionals is that amateurs practice a lot less. One of the children's piano method books has a song about the 20th century Russian pianist Vladimir Horowitz, and a line of lyrics that runs "If I had Horowitz's talent, I'd practice all day." But the only way Horowitz got to be that good was by practicing all day. You can't wait around and see if you are going to be great and then practice, you have to put in the work first. And the more accomplished you get, the more work you have to put in to maintain all that, and because your standards are higher, it will take more to meet them. Most people won't notice if you miss a note or two along the way or play a phrase a bit woodenly. But you will. Which is why concert pianist Arthur Rubinstein quipped, "If I don't practice for a day, I notice. If I don't practice for two days, the critics notice. If I don't practice for three days, the audience notices." But practicing can also be a joy at times, and it leads to results that can be truly satisfying. Rubinstein also said, "Don't tell [my agent], but I would play for free." Which is good, because that is about what some of us are getting paid most of the time! Is there much difference between a piano and an organ? If you are particularly accomplished at either instrument, yes. If you are not, then not so much. But the music written for the two instruments, when it is written well, is also very different. For one thing, a piano has a sustaining pedal which allows notes to continue sounding so long as your foot is on the pedal. You don't need your fingers to maintain contact with the keys. An organ does not have a sustaining pedal. The instant your fingers leave the key the note stops sounding. Thus you cannot play a chord in the bass and moving your hand up to the high part of the keyboard in a flashy sweeping gesture and make it work. On a piano, that would sound impressive. On an organ it would sound stupid. On an organ you can get a vast number of very different kinds of sound according to the banks of pipes you employ. You generally have at least two different keyboards on which you can create very different sounds which you can play simultaneously, as if you had a string section and a woodwind section in an orchestra sounding together. On a piano, you can get different kinds of sounds by applying different key pressures, but the sounds are not different in quality so much as in quantity. That is, you can make the melody note louder than the surrounding notes by playing it louder. Not so on an organ. It will not respond to the pressure of your fingers--all the notes will sound equally loud. If you want to make a melody stand out from the accompaniment, you either need to put it on a different keyboard (manual) than the accompaniment, or play it with a different articulation--for instance, play the notes connected, while the ones in the accompaniment are disconnected. An organ sound will also not die away so long as your fingers are on the keys, but a piano sound starts to decay immediately. Good music for the organ tends to allow for rich chords, and moderately paced running passages. Piano music is more likely to feature rapid figures, and have moving accompaniment patterns, to compensate for the lack of sustained pitches. And, while we're on the subject of feet, might I point out that the feet have a lot more to do on an organ, since there is an entire group of keys down there. Sometimes the feet are just as busy contributing to the sound as the fingers are. Somebody said that if an organist isn't worried all the time, he should be! On a piano, the feet have their assignments too. In fact, the sustaining pedal is a quite subtle and tricky thing to master, as simple as it looks. A real artist's right foot will be in almost constant motion some of the time. On the other hand, the left foot, when not being used to deploy the "soft" pedal, frequently gets the night off. for more details, visit these pages about the construction of the piano, and the organ. Do you have to tune an organ? Yes. 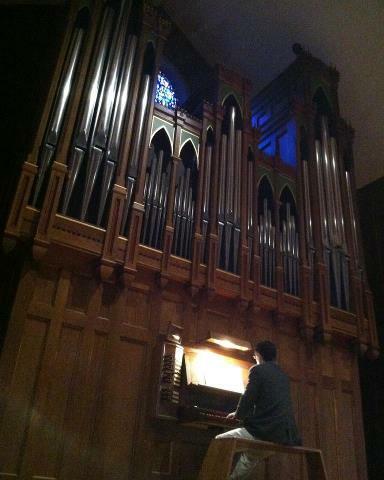 Our church organ gets tuned twice a year. Unfortunately, it is not cheap. But that's because it takes about four or five hours to do it, and they always send out two people. One of them sits at the console and plays the notes on various stops and stop combinations, and the other one crawls into the pipe room and adjust the sleeves at the end of the pipes up or down slightly depending on whether he wants to lower or raise the pitch. The reason pianos go out of tune is because with changes of temperature and humidity the wood in the instrument expands or contracts and causes the strings to do likewise. Organ pipes are also made of wood and metal, two elements that also like to try out different sizes according to the weather. But whereas a piano tends to go sharp or flat with some degree of uniformity, an organ makes it more interesting by going in both directions--the wooden pipes will go one way, and the metal ones the other. The result can be that just changing from one sound to the other makes it sound as if you've just changed keys! Then it is very definitely time to get it tuned. We get ours tuned in June and December, after the season has changed and the temperature has leveled out a bit (which is also a good timetable for a piano). When concert pianists go on vacation, how do they practice? What do they practice on? If they go camping, go on a cruise, or simply visit a foreign land to get away for awhile how do they practice and what do they use? If it is a portable keyboard what type: brand, number of keys, weight, do most of them use? I can't speak for all concert pianists (and I haven't really asked anybody about this)--all I can do is offer my own experiences. I guess the first thing to note is the word "vacation." If it is really a vacation, maybe the point is to get away for a while. Sometimes when on vacation I don't practice at all, partly because it is too difficult logistically, and, occasionally, because I want a break. But suppose a concert is coming up. What do you do then? Sometimes I make arrangements with the people I am staying with for use of a piano somewhere. When I visited my wife in Germany for two weeks a couple years ago I was able to practice every day in a room in the same building that happened to have a piano. When I am staying with my folks or in-laws for the holidays I usually practice at their church or on their piano at home. I haven't been on a cruise, but I'll bet I could sneak in some time at the piano if I asked. Rachmaninoff spent much of his time enroute to America practicing his Third Concerto on a dummy keyboard. Electronic keyboards with headphones are an option (but hard to carry around Europe!). If the 'vacation' is also a concert tour you generally get to warm up in the hall beforehand if nothing else--there is usually rehearsal time into the bargain. I've also pilfered practice time in piano showrooms, hotel lobbies, and college practice rooms if I know someone connected with the local school who will sneak me in. There are pianos everywhere. Not necessarily good ones, but they are there. The trick is get the access. But for a camping trip? no idea. I guess you could hook up a keyboard to your RV. But if you are really into the camping experience: tents, canoes, and so on--why bring a piano? By the way, keyboards have gotten a lot better in recent years. I don't know if there's a preferred brand (most concert pianists prefer real pianos--Steinway grands please), but anything that has a good sampled (meaning recorded from an actual piano) sound and is weighted to mimic the action of a real piano will do in a pinch. Many conservatory students have them in their apartments these days because they can't afford pianos and practice time is really hard to get at overcrowded schools.